A long time ago in a galaxy far, far away, a carbon-oxygen rich white dwarf star erupted in a gigantic thermonuclear explosion. The resultant supernova was designated SNLS-03D3bb and it revolutionized astronomy as it was twice as powerful as was thought possible. It took four billion years for evidence of the cataclysmic paroxysm of that distant sun's ebullient demise to reach earth in the form of an unusual pale yellow light. SNLS-03D3bb was soon nicknamed the "Champagne Supernova". Closer to home in the URWERK solar system, an incredible celestial fulmination of orbiting satellites, spinning discs and Zirconium Nitride, created another supernova. Reflecting an ethereal pale yellow light from its incredibly tough surface, this new timepiece in the horological firmament was designated the UR-110 ZrN Torpedo, aka the "Champagne Supernova". ZrN is for Zirconium Nitride: A champagne-coloured high-performance ceramic machine tool coating which, while only a few microns thick, is very hard (2000 Vickers); provides excellent scratch, wear, and corrosion resistance; and exhibits good lubricity and ductility. The ZrN coating is vapour-deposited over the sandblasted steel bezel to provide the timepiece’s distinctive frosted pale gold effect. 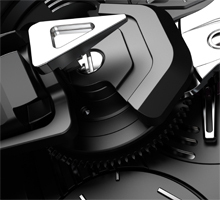 ZrN coated tools are suited to non-ferrous metal applications, e.g. aluminum, copper and titanium, and are used for coating medical devices and aerospace components. The UR-110 ZrN Torpedo is an Édition Spéciale of just 12 pieces, making it a very Rare Species, and is available exclusively from Chronopassion (Paris), Marcus (London), The Hour Glass (Singapore) and Westime (Los Angeles). Each individual timepiece will be identified by a red satellite hour numeral. From the base of its unusual asymmetrical case to the three arrow-shaped "torpedoes" flying in formation with the mission of indicating the time, the UR-110 has serious attitude. Enveloped in a secure titanium case, planetary gearing keeps the three hour satellites in parallel formation while they take turns to indicate the time as they pass the 60-minute track. An "Oil Change" indicator alerts the user when it is time for a service; a "Day/Night" indicator helps keep track of changing time zones; and twin turbines on the back minimize wear in the automatic winding system. 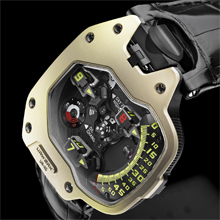 The UR-110 continues URWERK’s radical tradition of telling the time using orbiting satellite complications. In the UR-110, the time is always shown on the right side of the watch. The satellites follow a vertical line, graded from 0 to 60 minutes, in a downward motion. The ingenuity of this layout lies in allowing the wearer to view the time discreetly and elegantly without the need to pull back a cuff or sleeve. "The UR-110 is a logical evolution of our creations," says Martin Frei. "We imagined time as a ‘silent journey’ where the hour satellites make a full rotation of the dial. But it is a velvet revolution; between rotation and counter rotations the effect is subtle and fluid. There are things happening on the dial that are not obvious at first glance. Everything looks normal. However, in fact they are everything but." The UR-110 is a timepiece in which its technology can be appreciated though the large panoramic sapphire crystal. As well as indicating the hours and minutes, the UR-110 also features a Control Board on the dial side with indicators for "Day/Night" and "Oil Change" (URWERK's service interval display) as well as small seconds on a sub dial. "The beauty of the UR-110 is in its apparent simplicity," explains Felix Baumgartner. "The development of UR-110 mobilized our entire team for nearly two years. Among the challenges posed by this complication was working out the optimal architecture for supporting the central carousel and the rotating hour modules. We finally opted for a technical solution that is radically different from any of our other creations: Instead of ball bearings, a fixed axis runs the full height of the watch, providing maximum rigidity and minimum play. The whole complication is perfectly balanced on this axis." The frosted champagne colour of the *Zirconium Nitride prevails on the steel bezel in juxtaposition with the technical gray of the titanium case. Legibility is assured by bright yellow Super-LumiNova minute and hour numbers - the latter with the timepiece's identification number in red - set in the subtle perfection of the superbly finished mechanisms. Turning the watch over reveals the titanium back enclosing an innovative automatic winding system regulated by dual turbines. An Édition Spéciale of just 12 pieces available exclusively from Chronopassion (Paris), Marcus (London), The Hour Glass (Singapore) and Westime (Los Angeles).